In 1976, when the watch making industry was in the throes of a crisis, one man named Raymond Weil decided to float his own watch company. He named his watchmaking company after himself and started selling his designs initially in Europe. As the popularity of his watch models increased, he turned his sights to other countries across the world. The Raymond Weil brand received impetus in 1982 when Raymond Weil's son-in-law, Olivier Bernheim, joined the company. Oliver formulated a business plan to further develop the Raymond Weil brand and used it to conquer new markets across the world. In 1999, Olivier started the research and development department in the company and this revolutionized the designing process. In 2009, Raymond Weil opened its first subsidiary in the United States, followed by retail outlets in other parts of the world. In the highly competitive market of Swiss quartz watches, Raymond Weil started young compared to other Swiss watch brands. However, within few short years, the brand has managed to establish itself and is one of the most popular watch brands in the world today. There are few unique reasons why Raymond Weil has become a highly coveted brand. It is the first luxury watch brand to open an exclusive club just for Raymond Weil watch owners. The Raymond Weil brand also is active in location-based social media. It is the first watch brand to use Facebook commerce, also known as Fcommerce. In 2007, Raymond Weil became the first luxury watchmaker to create its own island on the prestigious Social Life channel. This has allowed Raymond Weil to have personal interaction with its existing and prospective clients. It uses social media effectively to convey its uniqueness to clients and create brand awareness. Nabucco. The Nabucco Cuore Caldo Twelve is a special edition gents watch from Raymond Weil. It works on a chronograph function, which has a power indicator at 6 o’clock. This prestigious timepiece has carbon fiber, titanium, stainless steel and 18 carat rose gold. The wristband is made of vulcanized rubber. 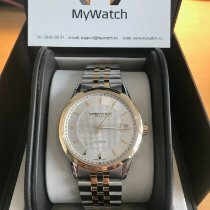 Since it is a limited edition Raymond Weil watch, only 76 pieces are available and part of the sale proceeds is used for treating children afflicted with cancer. The back case of the watch is screwed with a sapphire crystal and the dial is black with indexes. It is water resistant up to 330 feet. The dial has antiglare properties. The crown of the watch sports the famous Raymond Weil logo. Freelancer Black 8. This is a special edition Raymond Weil watch is made for men. It uses the beauty of black color and the magical effect of diamonds to the hilt. The movement of this Raymond Weil watch is mechanical, with automatic winding. It has 26 jewels, giving it a luxurious look. The case is made from polished and brushed steel, and the bezel has 66 diamonds of 0.47 carats set in polished steel. The dial has antiglare properties because of the sapphire crystal. The stunning dial is black and fitted with 12 diamonds of 0.05 carats. The hands are made of diamond baton, which are luminescent. The strap is quite elegant and chic, as it is made of sleek black Crocodylus niloticus skin and for additional security, it has push-pierce locking mechanism. This is one of Raymond Weil’s most irresistible and elegant watches. Freelancer Summertime. The Raymond Weil brand has not forgotten its female clients and this model, the Freelancer Summertime, is designed specifically for women. It is a mechanical timepiece also has the option of automatic winding. The watch is available in different colors, including natural tones, so women can buy the color they like. The case is made of brushed steel and the bezel is circular in shape with diamonds on it. There are 12 full-cut diamonds which represent the dial. The strap is a saddle-stitched, full-skin alligator and it comes with double push-piece security. This special edition Raymond Weil ladies' watch is extremely stylish and sensual. Parsifal Automatic Chronograph. This is an exclusive gents' watch from Raymond Weil. Its case is made of stainless steel and 18 carat rose gold. The anterior part of the case is screwed with a sapphire crystal and the crown has the Raymond Weil in smooth, polished lacquer. The dial is quite interesting to look at, as it is black in color with Roman numerals. The date window is between 4 and 5 o’clock. This Raymond Weil watch has a vintage feel to it, but it is extremely modern in its technology. The achievements of Raymond Weil are not just limited to the watch industry. Raymond Weil is involved in many social initiatives, such as fighting cancer and providing support to the onco-hematology unit at the Geneva University Hospital. Raymond Weil also partners Nordoff-Robbins Music Therapy, which is one of the largest music-oriented charities in the world.